AristoCraft Trains produces a very good G scale model of an SD45. The two units below are fantasy schemes based off of Santa Fe prototypes. The warbonnet scheme was never used on the SD45. Both models were fully detailed including sunshades, mirrors, snowplows, airhoses, MU cables, working beacons, speedometers, and full under body detail. These units are made to work as a pair and are wired as such. They include a Phoenix sound system in addition to the details. 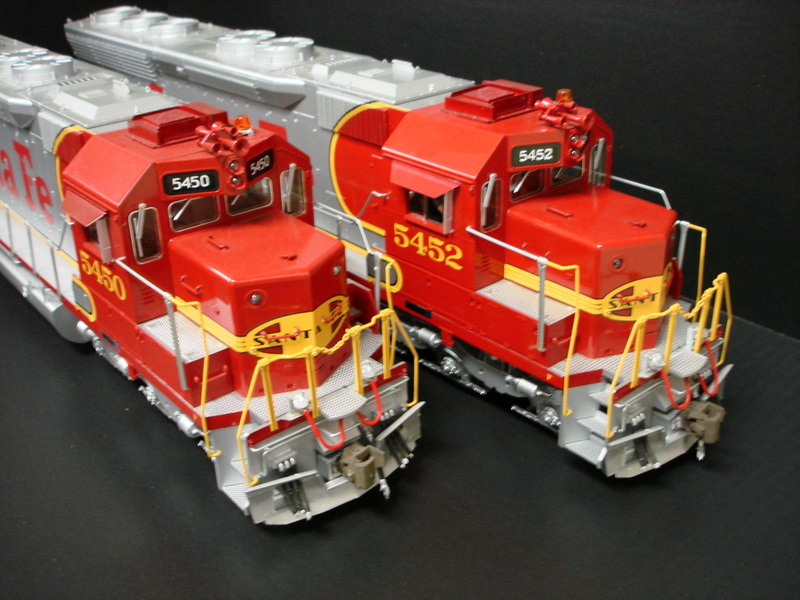 These were the first G scale diesels that I ever worked on. I have another Santa Fe SD45 (in prototypical bluebonnet colors) that is on the bench waiting to be detailed.